Cost Segregation is a video that shows how significant savings can be realized by your business by accelerating depreciation deductions. This applies to all commercial real estate owners. Such as, apartment complexes, commercial buildings, medical offices etc. A properly conducted and properly documented cost segregation study provides evidence and support for claiming depreciation deductions over a much shorter time period. This saves you tax dollars today and keeps your cash in your pocket. For almost two decades, the PriceKubecka Dallas CPA firm has been providing professional tax, audit, and accounting solutions, strategies and assistance for businesses in the Dallas Fort Worth Metroplex and other regional cities. Our team includes seasoned professionals that bring experience from both the private sector and larger, national CPA firms. This synergy of experience enables us to provide unparalleled expertise and specialization to large firms and small businesses alike — all with the personalized attention and responsiveness you deserve. 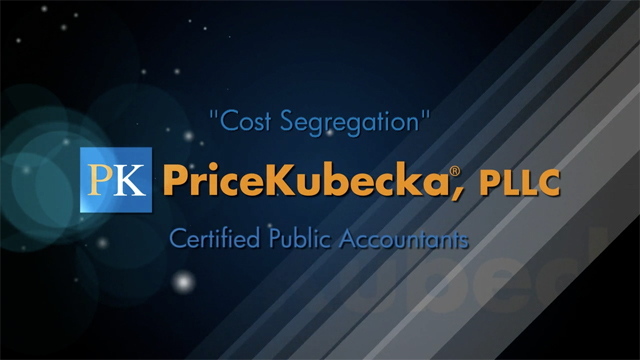 PriceKubecka is a professional, strategy-driven CPA accounting firm with the know-how to improve profitability and take the anxiety out of tax, audit and accounting issues. We focus on meeting the accounting, tax and auditing needs of companies on the move — like yours — ensuring your financial situation is in line with your overall business strategy. Let us provide your business the peace of mind it needs to flourish. A Motion Media Solutions and Ross R. Mason video production service for business professionals to present yourself.